Is there anything better than a brownie? Well yes there is – a stuffed brownie! 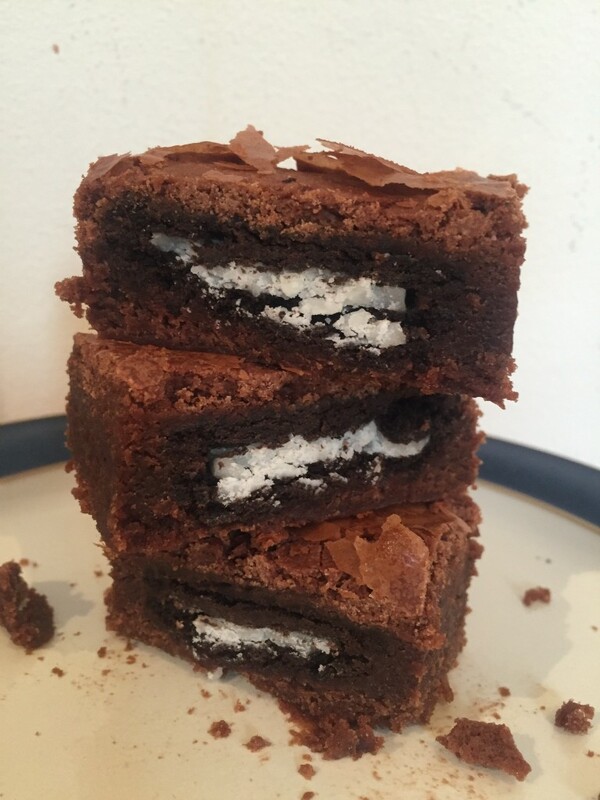 Each Oreo is like a little present wrapped in a brownie parcel! 1) Preheat your oven to 180 degrees. 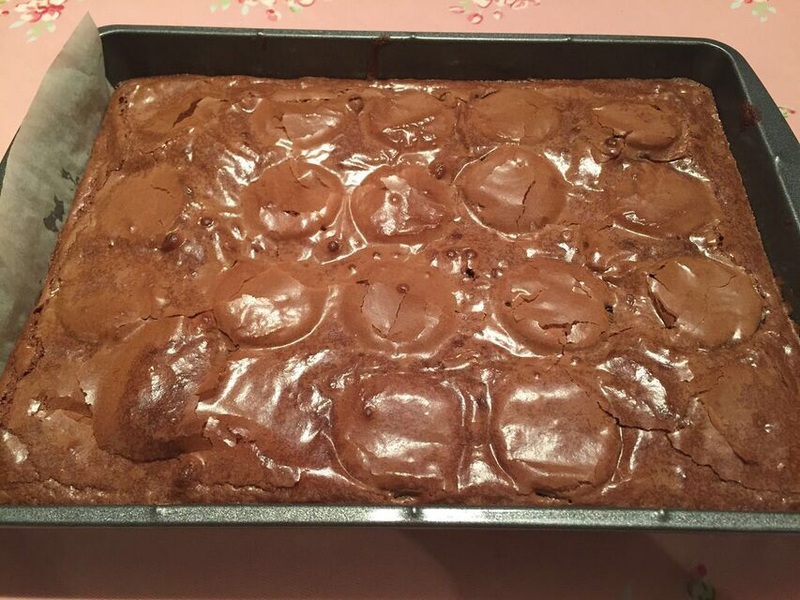 2) Grease and line a rectangular brownie/traybake tin. 2) In a large saucepan, melt the butter over a medium heat. 4) Once melted, take the pan off the heat and pop the dark chocolate into the melted butter. Stir. 5) When the chocolate has melted, add in the sugar and stir thoroughly. 6) Add in the milk and the flour, along with a pinch of salt. Stir until you have a thick chocolatey mix. 7) Add one egg at a time, stirring after each addition. Your mixture will thicken after each egg! 8) Pour 2/3 of the mixture into your prepared traybake tin. 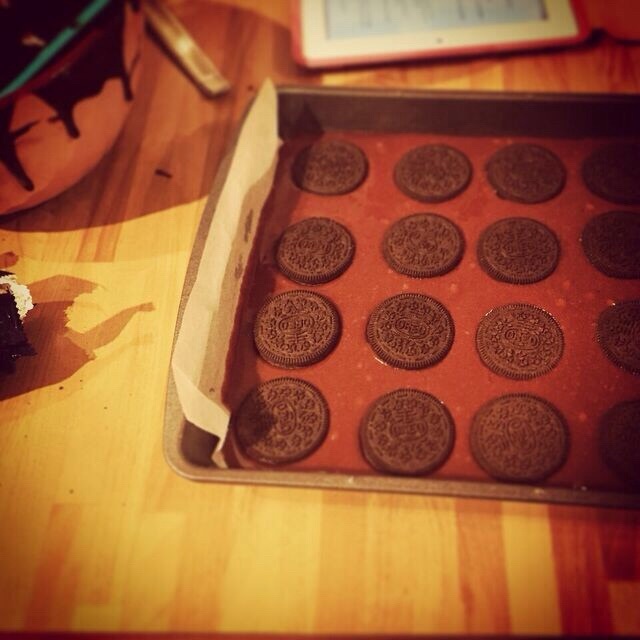 9) Press the Oreos into the brownie mixture in the tin. You should be able to fit 4 Oreos going across the shorter sides of the rectangle and 5 Oreos going down the longer sides. Push them down so you just see the tops of the cookies. 10) Pour the remaining 1/3 of brownies mixture of top of the Oreos and use a spatula to carefully spread, so that each of the cookies are covered. 11) Bake in your oven for 25-30 minutes until the top has a papery look and the middle still has a bit of a wobble! 12) Leave the brownies to cool completely in the tin before slicing. You will be able to see a faint outline of each Oreo, so you should be able to cut 20 squares, each with an Oreo encased inside. These brownies can be stored for up to 3 days in an airtight container. Foodies Festival You Were Brilliant! To keep up to date with the latest news, recipies and competitions please like me on facebook, follow me on Twitter or sign up below!